Fine and delicate it's a perfect dessert wine for a summer party with friends. Try it chilled, as an unusual aperitif. 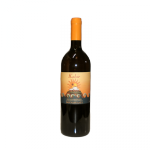 Its sweetness, balanced by a nice freshness, perfectly matches with tasty cheeses (such as goat-cheese), fruit pies, ice creams and fruit salads. Try it with bottarga (dried, pressed mullet roe) and smoked fish as well.